My base dn is dc=effy,dc=cz. And it contains two organizationUnits ... ou=people (to hold users) and ou=groups (to hold user roles). 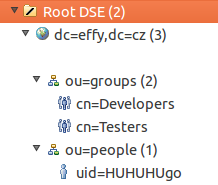 Groups (Roles) are presented by objectClass groupOfNames, they are identified by cn. People (Users) are of objectClass inetOrgPerson, thus identified by uid. Security settings are located in Administration (/manage) -> Configuration (/configure). The first step is enabling security settings ... that is done by checking check-box Enable security. The second step is choosing Access Control ... in my case LDAP. This configuration is pretty simple as long as you have the expected LDAP structure, it could be quite difficult otherwise. You can note that I had to only think about server address and root DN because other values are standards and I am using anonymous LDAP access. The third step is configuring authorisation rules. The first option (Anyone can do anything) is probably not what you want, because than there would be no need for the LDAP in the first place. I have chosen Matrix-based security, mostly just out of curiosity as I am going to be the only user in medium-term plan. The only trick here is, that you need to add the groups controlled yourself. Self discovery would be nice, but that is just my opinion. An interesting and documented feature is that user is assigned two roles per LDAP role. One in upper-case with ROLE_ prefix and one named exactly as in LDAP. 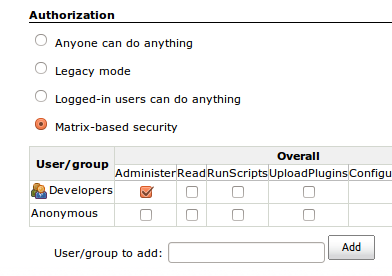 Jenkins offers various security settings which are quite simple to use. This post describes how LDAP connection works and what are its options. I recommend always to use some sort of access control for Jenkins, even if you are going to use Logged-in users can do anything option, just to control the access to Jenkins. I ahve also integrated the LDAP setting for my Jenkins & it is not throwing any error for the fields for LDAP. Now the issue is that i am not able to enter using my LDAP cedentials in Jenkins. Any help please??? 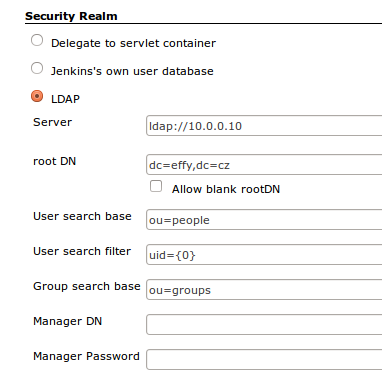 unfortunately there is next to none validation of LDAP settings in Jenkins, the only validated field is Server url. It it hard to tell where is the problem without further description. verify, that your LDAP has Anonymous access enabled, or try filling the Manager DN a his password. And in any case, I would recommend checking the log of the Jenkins (consult a documentation for your system for its location) after unsuccessful login attempt. I am new to LDAP and all I need is to set up LDAP working with Jenkins. Your guide seems to be pretty nice. Though I can't figure out how to define member attribute in groupOfNames object. And what types of objects are used further in groupofnames to create other groups. And in people as well. Could you please clarify it a bit? I can certainly try. My example LDAP structure shows only the most basic objects. There are two "folders" of class organizationUnit to keep data organized. One represents Roles (ou=groups), the other Users (ou=people). Those names are completely arbitrary. 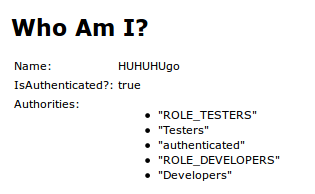 Objects of the class groupOfNames represents the actual Roles (Developers,Testers), these are not only a labels for privileges we want to assign, but they also contains information about their members. Objects in ou=people are object of the class inetOrgPerson and they represent users and the most important info they contain is uid, name and password. Adding member attribute to the groupOfNames should be straightforward, but it very much depends on what tool you use to create your LDAP structure. This post might help you http://krams915.blogspot.cz/2011/01/ldap-apache-directory-studio-basic.html.